Perhaps it’s because this winter has been so much more intense than usual, but Narnia seems to be on the mind of many this season. My friend Devon from Nitty Gritty Life recently made some Wild Rose Turkish Delight that sounds pretty magical, and the ladies over at Gather Victoria have been making all kinds of wintery confections that would be perfect to tuck into the pocket of your coat to fuel an adventure in the land behind the Wardrobe. Speaking of my sister, she's a big part of the reason I wanted to try a crepe cake in the first place! She cut sugar out of her diet almost completely this year and says she feels so much better in general- more energy, more focus. She misses extravagant and beautiful desserts, though, so I wanted to find a recipe for a dessert she could enjoy as well. Most cakes contain ridiculous amounts of sugar and are honestly way too sweet for me to enjoy anyways. But guess how much sugar is in this ENTIRE CAKE? 1/2 cup. That's right. 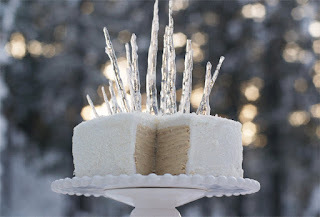 My sister can enjoy it without worrying about a "sugar hangover" and I can enjoy it because I don't get overwhelmed with sweetness after the first bite! Hooray! This is such a delightful option if you, like me, enjoy slightly sweet treats where the flavors take center stage. Another bonus? This cake is totally gluten and dairy free! And man oh man does it taste good... I've always thought almonds, coconut, and rose are a match made in heaven. The textures of the crepes and pastry cream taste wonderful together. It's definitely a delight for the senses! I wanted to due my inspiration justice, so I flavored the coconut pastry cream with some wild huckleberry-rose vodka I made during the summer. Huckleberries are surprisingly fragrant fruits so even just a little lends a lot of flavor to a mild base like pastry cream. You could try adding rose water, orange blossom water, or other flavored extracts to your own. Don't those delicate stripes look lovely?? 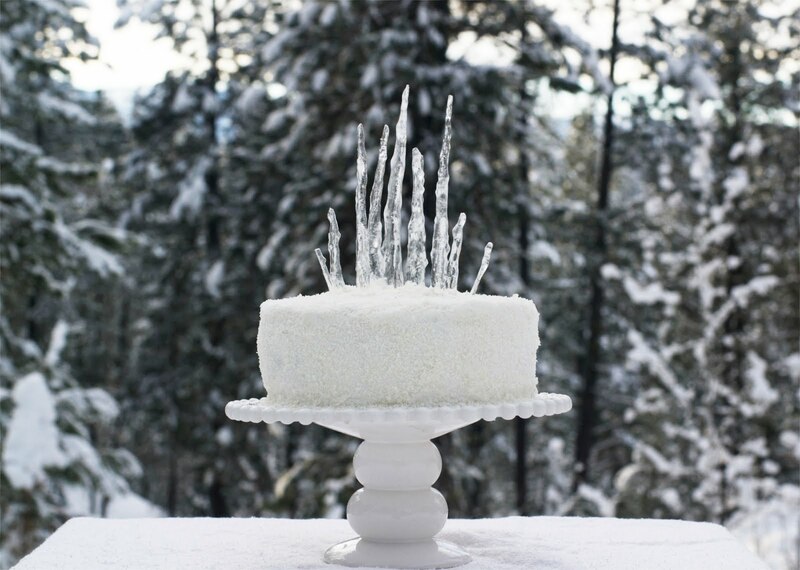 As you can see, I decorated the cake with real icicles. These should obviously be removed before serving ;) Another word of advice: this cake tastes MUCH better at room temperature. After the photoshoot the cake was pretty chilled and we found we could barely taste all of the delicious flavors until we warmed it up a little. 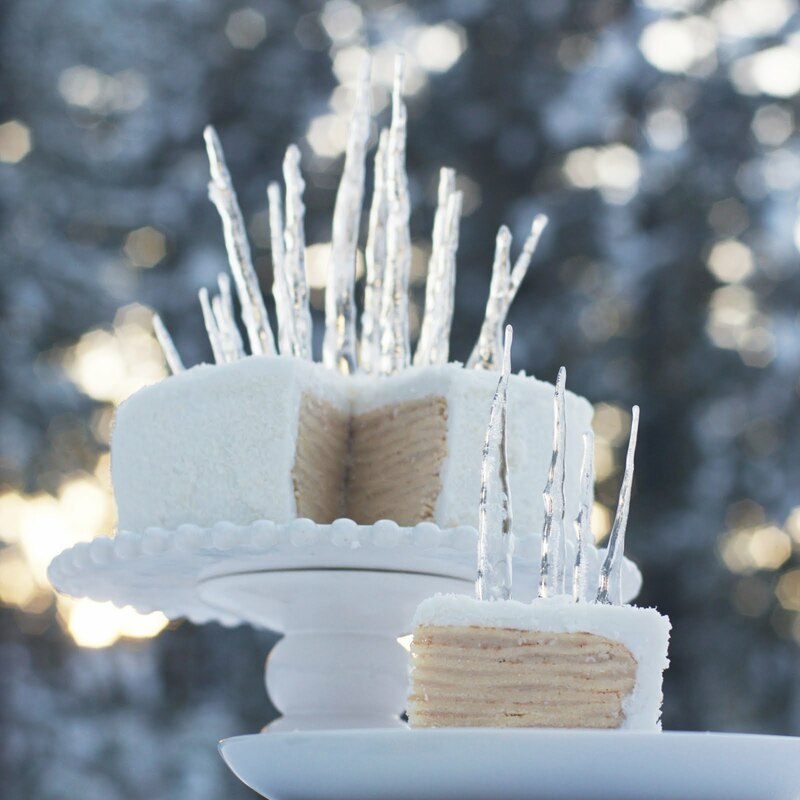 A warmed piece of this cake is divine, though. We also put some rum and fruit syrup on top and that was pretty spectacular as well. Mix everything well in a blender until it’s smooth and about the thickness of heavy cream. Let sit (covered) for about 20 minutes. Meanwhile, heat up a medium pan over med-low heat and grease it well. (While I’m making crepes, I keep a paper towel and bottle of vegetable oil nearby to grease between crepes, but you could also use a stick of butter if you aren’t allergic to dairy.) To make the crepes, pour 1/4 c. (or 1/3 c. if you pan is larger) batter into the pan, tilting to coat the whole bottom. Place back over the heat and cook until the bottom just barely starts to brown and you can easily flip it. Turn it over and cook until the bottom sets up and is golden. Remove the crepe from the pan and re-apply oil and repeat the process, placing the crepes on a pile on a plate as you work. Beat until thick and well combined. When the coconut milk mixture is bubbling, slowly pour it into the egg mixture in a small steady stream, beating the egg mixture continuously. When all of the coconut milk is incorporated, pour the mixture back into the saucepan and return to the heat. Bring to a simmer, stirring continuously, until the mixture thickens to the consistency of thick yogurt. Remove from heat and transfer to a heat-proof bowl. Stir in 1 Tbs. of wild rose and huckleberry-infused vodka (you could also use rose extract, orange flower water, or another flavoring of choice.) Cover with a layer of plastic wrap (make sure it touches the surface of the cream to prevent a skin from forming) and leave to cool. 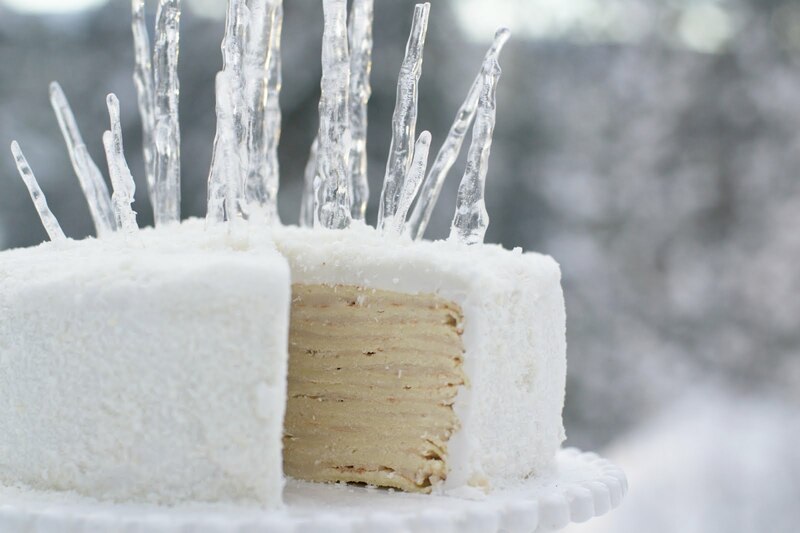 When both crepes and pastry cream have cooled to room temperature, start layering them. Put a crepe down and smear a heaping spoonful of pastry cream on top, then place another crepe on top of that, etc. Continue until you’ve used up all of the crepes and/or pastry cream. Leave to chill for several hours. Remember how I said the whole cake only contains 1/2 c. sugar? I lied. There's plenty of sugar in the frosting, but feel free to just leave this off if you'd like. The cake tastes amazing without it (though doesn't look quite as pretty.) You could also cover it in lightly-sweetened whipped cream or even cream cheese or marscapone - both would taste delightful with the crepes. In a medium bowl, beat 1/2 c. unsalted butter or shortening. Add 1/2 cup powdered sugar and beat until stiff. Continue to add powdered sugar, alternating with coconut cream (liquid) until frosting reaches the desired consistency/flavor. I added about 2 cups of powdered sugar and about 3/4 c. coconut cream (which was very thick- you may need less if you use coconut milk.) Mix in 1/2 tsp. salt and 1 tsp. almond extract. Frost the cake and cover in unsweetened coconut flakes. Looking for the perfect homemade gift to give a loved one with a sweet tooth? Here's your answer! These are easy, delicious, and incredibly festive. 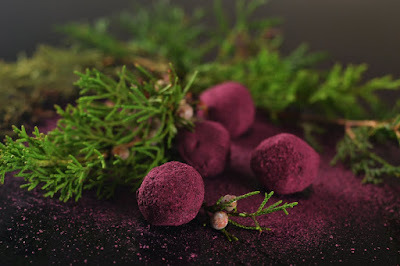 Silky chocolate ganache in earthy winter flavors is cloaked in crisp tempered chocolate and rolled in a striking crimson coating of beet powder, which also lends it a subtle sweetness and earthy scent. Yum! In a small saucepan, quickly roast 3-4 juniper berries until fragrant (don't burn them!) then add 1/2 c. heavy cream (I used coconut milk so I could eat them), 2 Tbs. butter (or non-dairy shortening), and 1 tsp. 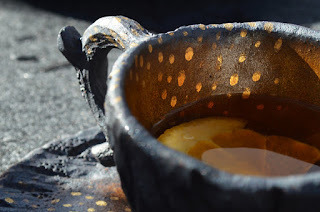 honey (or agave syrup if you are vegan.) 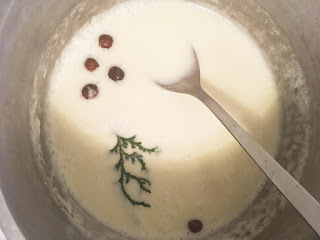 Bring to a gentle simmer then shut off the heat and allow the juniper to infuse in the cream mixture for a couple of hours. I added a bonus sprig of juniper foliage, which is optional. Place the mixture in the fridge and stir it every 5 minutes until it's thickened enough to roll into balls. Roll it into small balls and place them on a cookie sheet lined with parchment paper in the fridge. Temper your chocolate. 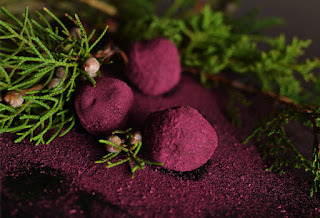 While it is tempering, prepare your beet powder: you can purchase it pre-powdered at most health food stores, but I made my own out of some dehydrated beets I had in my pantry. I just used a coffee grinder to pulverize them into a powder and then sifted it to remove any big chunks. Dip the balls of ganache into the tempered chocolate and then gently scoop them out with a fork. Tap the fork on the top of the bowl's rim to remove any excess chocolate (it will fall through the tines of the fork while the truffle sits on top), then place the truffle in the beet powder and gently roll it around. Remove and place on waxed paper to cool and harden. All done! Help me brainstorm new Patreon rewards! As you may know, I've started funding the surprise free events I do through patreon. You can check out my creator page to see what I'm up to! A few people have expressed an interest in becoming a patron at a higher reward tier, and I'm trying to come up with the best goodies to offer them. I would love your feedback and ideas if you have a moment to give it some thought. What would you like to see offered? What would make you want to up your pledge amount? A spoon designed to match each event. While it would be difficult to send patrons the relics from each event (see below), I could create a custom small piece of artwork to ship after each event as the start of a collection. One idea I had for this was to design a collectable spoon for each event. I would have a limit to the # of patrons accepted at that level so the artworks would be limited edition collectors items. Patrons who support me for a long time would eventually amass quite a collection! Monthly video chat with the artist. Once a month, I'd offer patrons at this level a chance to get in on the fun with an hour-long studio tour and some sneak peeks at works in process! Gift Packs with More Goodies: Right now, my highest level of gift pack includes a postcard about the event you helped to fund, a secret recipe sealed in a black envelope, and a cookie baked with the flavors I experimented with for the event. What if I made packs that included a few more items focusing on the current theme? 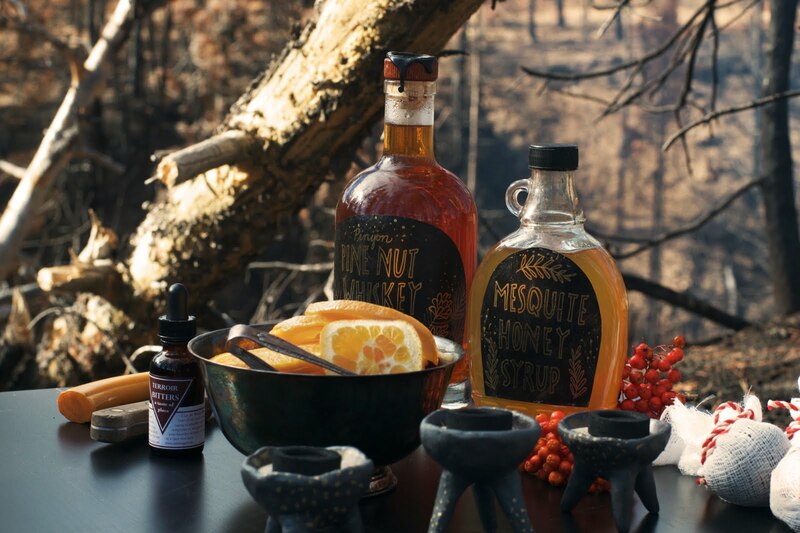 For example, each pack could include those things already mentioned, plus 3 other surprise seasonal goodies relating to the event all made with foraged ingredients (examples include homemade incense, bath tea, bitters, tea blends, infused spirits, handmade scented candles, fine chocolates, syrups, salves, infused oils, etc.) They would be designed as a sensory treat inspired by nature, and all packaged up in mysterious and elegant black packaging. Quarterly consulation or conversation with the artist: Got a project you are working on and want some advice? Are you planning a party and want an idea to really make it memorable? Patrons at this higher level would get a 1 hour quarterly chat with me (1 on 1) to gather inspiration and ask questions. It would also be a way for me to get to know my patrons better and connect with all of you a little bit more! Digital Files for printing: For each event, I'd send you 1-5 high quality digital files of photographs from the event for you to print for your personal use. A .pdf book about the event in more detail (including recipes! ): A digital file for you to download to read more about the event, the inspiration behind it, the culinary experiments that went into it, and last but not least some of the recipes from the event for you to try yourself! A chance to win a custom event, created just for you. As much as I love this idea, it goes against Patreon's rules for rewards. They have an anti-raffle policy to keep things fair and legal. A relic from each event, designed specifically for that event. I liked the idea of doing this as well, but the pricing varies so much on all of the pieces I make it would be difficult to do this fairly. Plus sometimes I sell all of the artifacts from an experience as a complete set rather than individually. A party once a year for high level patrons. This one might still be do-able, but the logistics would be tough. For one, I would have to have a cut-off date each year so that patrons would have had to contribute for a certain # of months beforehand (because it wouldn't be fair for someone who'd only contributed $50 to get to attend when someone who's contributed $600 is next to them!) It would also have to be held in the PNW and patrons would pay their own travel and lodging. The seat of honor at an event. I *could* create a high level tier with only 1-3 available pledges and send invitations to those "mega patrons" for each event I am doing, but I worry that it would change the dynamics of the guests' interactions at my events. For example, if all of the other guests at the event are curious hikers that discovered their invitations in the woods, would it be weird for them to rub shoulders with someone who paid to be there? (Or at least have the chance to be there)? So, what do you think? Like I said I am open to ideas! Let me know if any of these stand out to you or if you have any new ideas to add to the board! 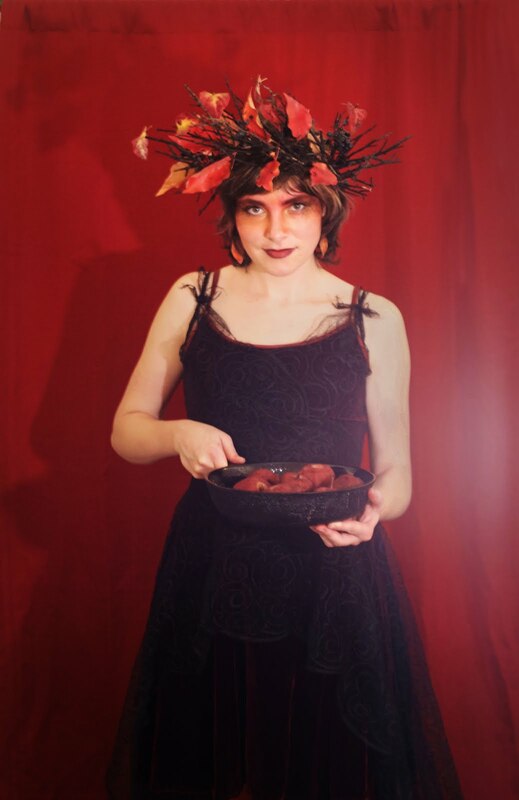 This year's Halloween costume: Lady Maple, Fae of Fallen Leaves. The yellow and orange leaves in the parks near my house and big bunches of black and blue berries inspired me- how many people have to go foraging to get their Halloween costume together? 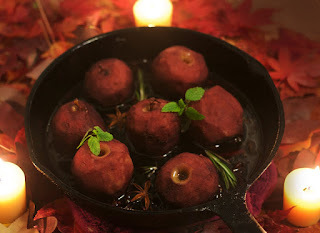 ;) I felt like some kind of pixie-witch hybrid in my long crimson skirt stooping over a pan of simmering wine-poached apples, an intoxicating scent filling my house. 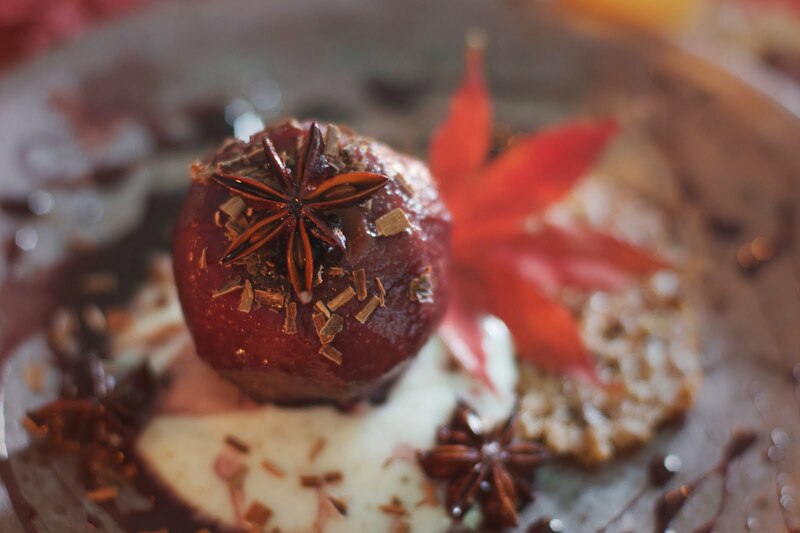 These ruby treats were served with vanilla yogurt, acorn almond lace cookies, a drizzle of reduced wine-maple syrup, and a generous dusting of dark chocolate shavings. Delightful. Here's the recipe if you want to try them yourself! Acorn Almond Lace Cookies: Preheat oven to 350F. Line two cookie sheets with non-stick liners. Heat 5 Tbs. butter, 2 Tbs. maple syrup, and 1/3 c. sugar in a small saucepan until the sugar dissolves and the butter melts. Bring it to a boil and then remove from heat. Stir in 3 Tbs. flour and 3 Tbs. acorn flour and a pinch of salt, then stir in 1/2 c. ground blanched almonds. Drop the batter by the teaspoon on the non-stick baking sheets (be sure to leave lots of room, this stuff spreads!) Bake until they are evenly light brown, about 10 minutes. Allow to cool a bit before removing from the sheets. And bring to a simmer. Gently add the apples, stirring and flipping occasionally, until they are dark red and tender (about half an hour.) Remove apples and strain the leftover liquid. Cook it down until it makes a thick syrup (about another half an hour) Use the syrup to top the apples and yogurt. Yogurt: This is as easy as stirring some vanilla bean scrapings or vanilla extract into high quality thick yogurt. You can sweeten it a little if you'd like, but the apples are fairly sweet so I didn't think it was necessary. To serve: Place a dollop of vanilla yogurt on each plate and top with a poached apple. Drizzle the reduced wine syrup over top and garnish with acorn lace cookies and dark chocolate shavings. 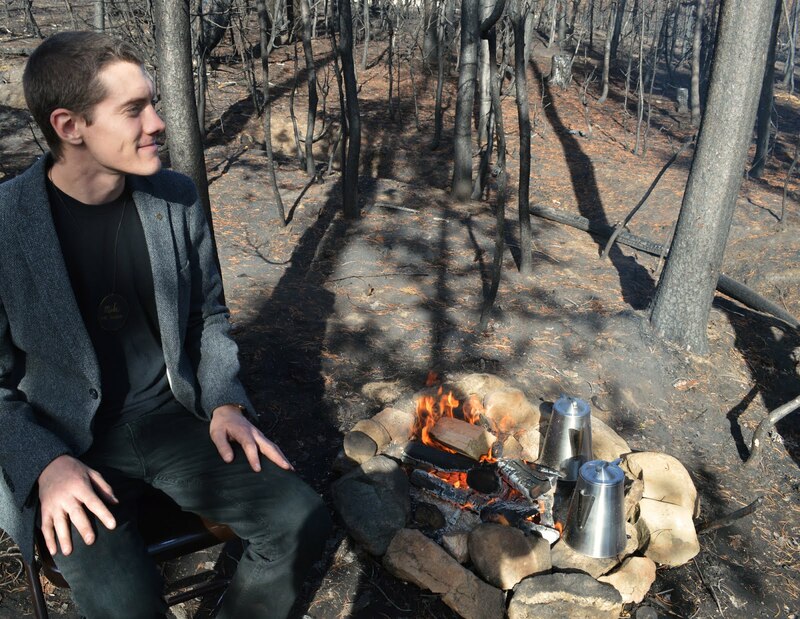 Fire is a part of life here in the West. Every August we brace ourselves for the crispy vegetation and smoke-filled air and watch as our beloved forests burn. But there is often beauty to be salvaged from the ashes and lessons to be learned. An ember smoldering under the surface represents a crossroads: will you fan it back into flames or bury it to let it die? Long before the first guests arrived, I had big pots of water boiling for flavorful teas to sip. I decided on two flavors: lapsang souchong (which is black tea smoked over pine branches and tastes like a campfire), or an herbal blend of rose hips, hawthorne, spices, and orange peel. In my invitations, I added a little note that the event would be semi-formal and to feel free to get crazy with dress. These lovely ladies definitely embraced that! How fun it was to see these elegant and funky outfits out in th middle of nowhere. After guests parked their cars in a designated area, one of my volunteers (who also happens to be my dad) walked them down a scenic trail through the burned forest. 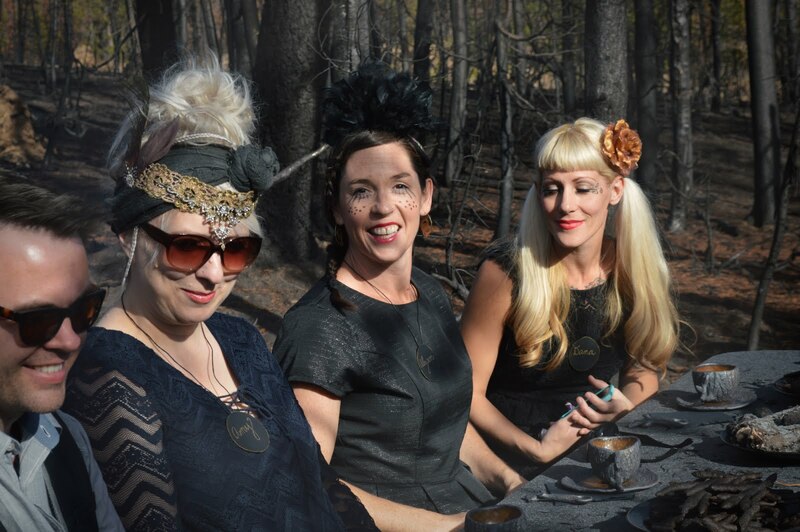 I then welcomed all of the guests to our location by smudging them with homemade incense with a basis of sage and birch. 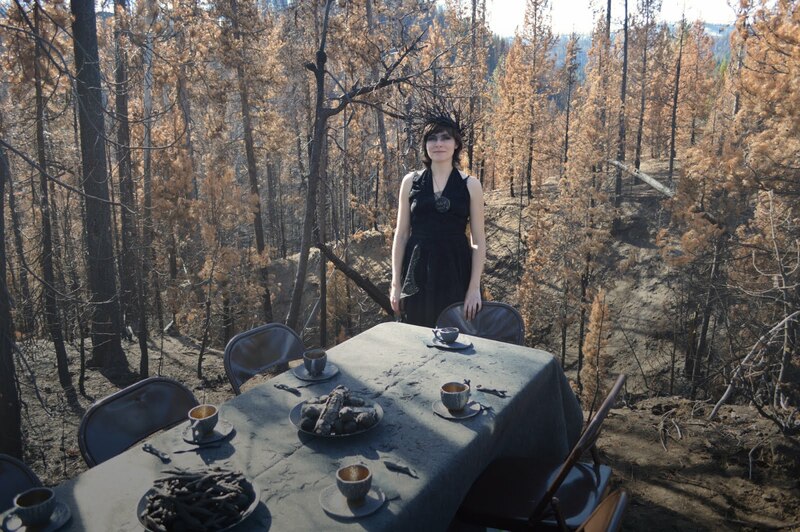 Then we all sat down at the table and I talked for a bit about the intentions of the event and the nature of embers. Embers are left after the fire dies down. 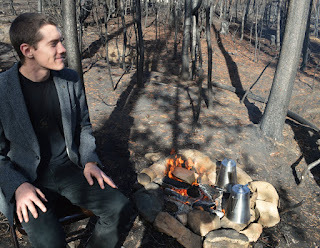 There is a melancholy satisfaction in examining the remains of a fire... the energy is different. While fire is all passion (anger, excitement, love, and lust) and can change in a heartbeat, the energy of embers is steady and calculated. Burned logs are ghosts of their tree-selves, still exhibiting the same bark patterns that are now black and carbonized. I asked each attendee to consider what their personal ember was and keep it in mind while we enjoyed our treats. 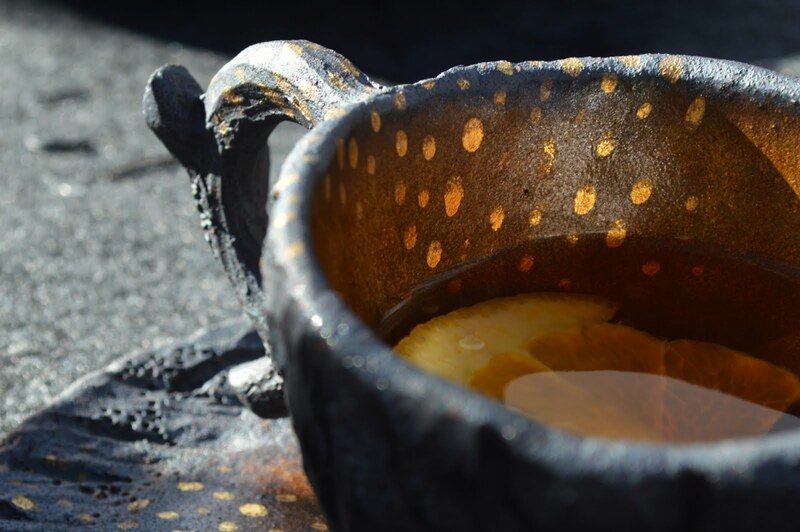 A beautiful close-up shot of one of the cups I made especially for Ember. I sculpted these out of iron-rich clay that turned almost black after firing, then embellished them with real gold luster to add some sparkle. 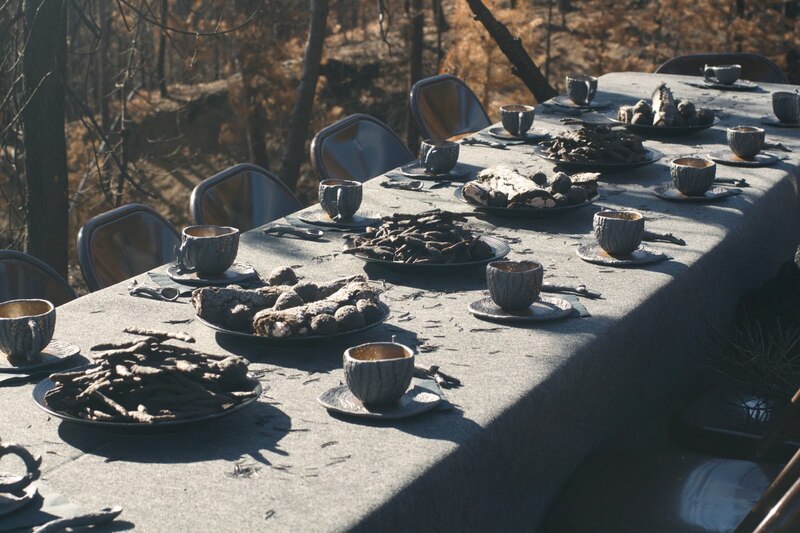 I wanted these objects to be elegant and luxurious while maintaining the roughness of their inspiration: burned logs and twigs. These cups will be available to the public on Dec. 11th and my Patreon supporters on Dec. 4th. 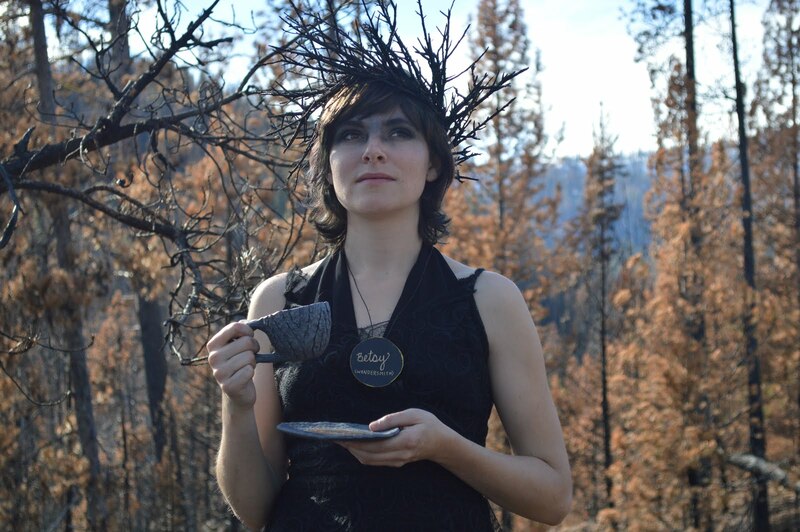 The guests enjoyed some ash-inspired treats while they sipped their tea. Pictured here: black sesame mochi with sweet potato and candied rose hip filling; black sesame mochi with beet, orange, and pine nut filling; and black garlic, juniper, and parsnip ash cheesy twig crackers. 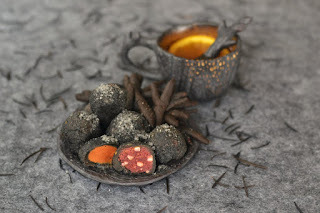 I loved watching the guests' surprised faces as they bit into the charcoal gray foods to reveal glowing orange centers, just like the glowing heat inside a real ember. 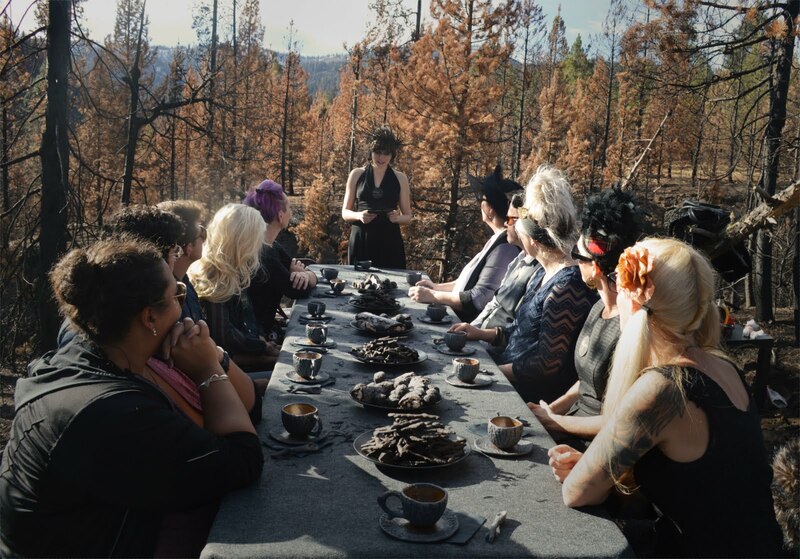 During the tea party part of Ember's ceremony, guests got to know each other between sips. 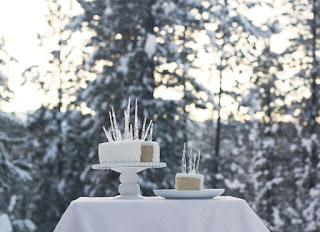 Pretty elegant for a party in the woods! This table held some special goodies to be added to our teas: homemade woods bitters (which will also be available for sale on Dec. 11th), pinion pine nut-infused whiskey, mesquite honey syrup, and fresh orange slices. Also pictured are some incense holders that were later used to burn incense as we chatted and ate. 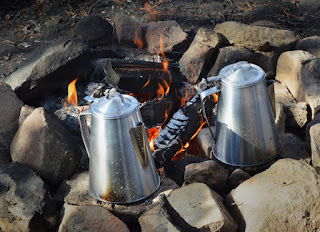 Mike the fire-tender was busy keeping our tea pots filled and warm! I love how well you can see our setting in this picture: the skeletal remains of charred trees and soot-blackened soil topped with warm orange pine needles. Just being out in those hauntingly beautiful woods was such a treat; having a delicious tea party with interesting guests was icing on the cake! 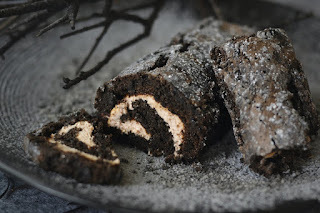 My personal favorite of the treats served at Ember was my spin-off on chocolate roulade cake. I made my version to look like charred logs and filled the dark chocolate goodness with rose hip jam and whipped cream spiked with rose hip-infused whiskey. I even made a dairy-free version (pictured here) with whipped coconut cream so I could join in the fun. I was so pleased with how everything at Ember came together! The warm and shimmery glaze inside my homemade stoneware cups perfectly matched the pine needles in the distance, while the felt tablecloth and various treats blended right in to the charred landscape. Sometimes there is just so much beauty to be found in the gray. While the guests finished their last cup of tea, I asked them to write down their thoughts about their personal "ember" on a little slip of paper. They were to consider something that had been simmering beneath the surface in their life for too long and prepare to make a decision to fan it back into flames, or bury it and let it die. After our tea party, we gathered in a circle around the fire and a pit and, one by one, had the opportunity to talk about our decision and then throw our paper into either the fire or the pit. Everyone present listened with respect, spoke from the heart, and made a little promise to themselves to follow through on a decision that would make their life better in some way. Some attendees decided to let go of relationships that were no longer serving them, others decided to fan a long-forgotten passion back into flames, and still others chose to keep their decisions to themselves and released them either into the ground or the fire with a silent determination. The guests who attended Ember were inspiring. 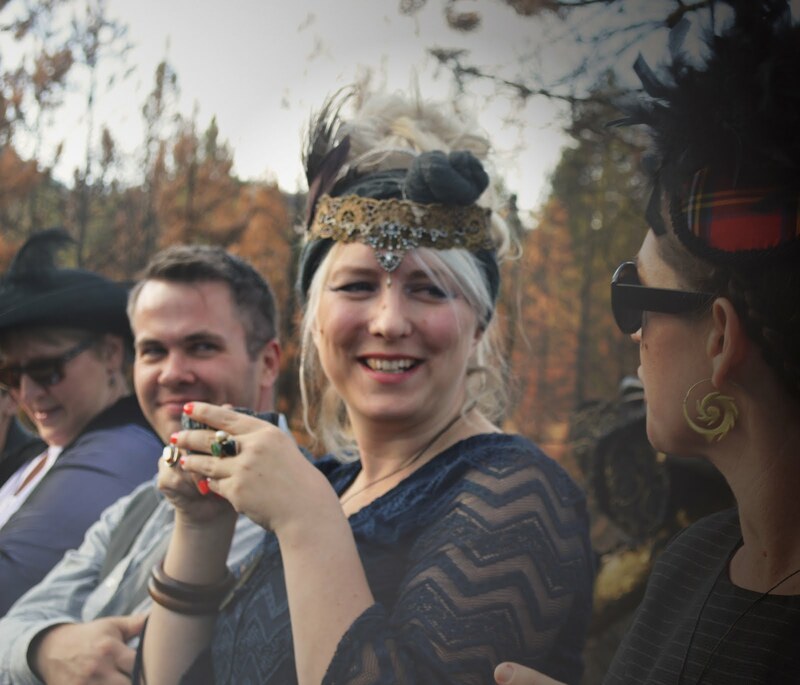 These wonderful people embraced the unknown by accepting an invitation hidden in a bookstore, driving out into the middle of nowhere, and participating fully in something largely unknown to them. All of the guests were warm and kind to one another and supported total strangers in moments of vulnerability. It was inspiring to watch the inherent goodness inside a random group of mostly-strangers. I feel so lucky that I was able to offer this gift to them. Many, many thanks to my patreon supporters that made this event possible. Your generous donations covered the costs of supplies for this event and it is with your help that I was able to bring a little more magic into the lives of these thirteen people! Cindy and her daughter Brooke are some of my most faithful supporters; they were so excited I was doing an event in their area that they went out and scoured bookstores after I dropped a hint on social media. Their love for adventure and kindness towards other humans is a beautiful thing to behold. 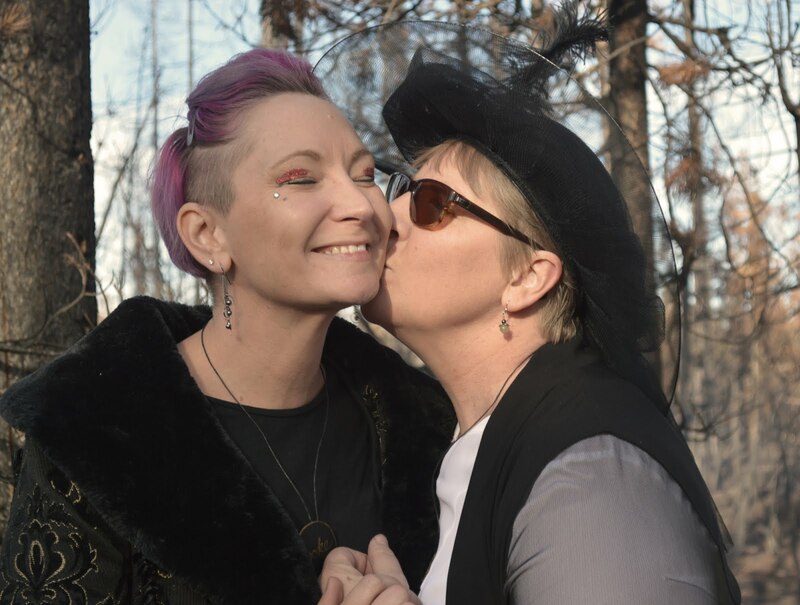 I sent them (and all of the other attendees) home with a little bag full of the homemade incense we burned during our ceremony so that they could re-connect with the memories of the day through scent far into the future. Ember was such a delightful and meaningful event for me. I love doing this. I love it so much. Mystery, magic, play... what exactly do those words mean? For many, either you believe or you don't. Either you see fairies or you see the real world, explained by science. Either you believe in God or you're a jaded Atheist, unable to put your faith in anything you can't see with your own eyes. But does it have to be like that? Does understanding how something works make it any less magical? A few years ago, I was planting a garden with my then-boyfriend. He peered inside the brown paper bag sitting on the soil next to me and said, "babe, this is just a bag of old potatoes. Where are the potato seeds?" I explained to him that a new potato plant grows from the sprouts coming out of the old potatoes. His eyes got wide and he said "wait... to make more potatoes, you just put a potato in the ground!?" I'll never forget that moment of magic for him. I grew up gardening so seed potatoes were old news to me, but for this city boy in his 20's discovering something new about the world, well, there was no doubt he was experiencing a moment of profound wonder. I felt very lucky that I got to experience that moment with him. His excitement over this seemingly-obvious natural cycle reminded me of the wonder of life and regeneration: how amazing it is than an acorn holds all of the information necessary to create a giant and majestic oak tree! How incredible that a tiny mushroom spore can turn into a giant organism of a complex mycelium network under the soil! And yes, how wonderful that one potato can turn into many with just a little soil, sun, and water. There is magic all around us, we just have to be open to it. Maybe I've just got a big case of 'Peter Pan Syndrome,' but I absolutely still believe in magic. I'm not into witchcraft or conjuring- instead I believe in normal everyday magic. Because is there really anything more powerful than remembering that our very existence is absolute magic? I believe I am practicing magic anytime I send a surprise package in the mail, or cook a nourishing dinner that will help to heal a sick family member, or hide a little note of hope for a stranger to find. Have you ever had a particularly insightful conversation with a stranger at a bus stop that leaves you with a new perspective for the rest of your life? I have. And maybe I've BEEN that stranger, who has suddenly and gently shaken the roots of someone's understanding of the world. The beauty of that is you won't KNOW if you're responsible for that sacred moment of clarity, since you will most likely never see that person again. That's kind of magical too, don't you think? Magic is setting up treasure hunts for your kids (thanks Mom), or inventing Dinovember (thanks internet), or staring out at the ocean and envisioning all of the sunken treasures yet to be discovered. You may have seen my event "Lady Fern's Soiree" that I did last May. I wrote elegant invitations on purple ferns, then I hid them in the woods around Eugene, Oregon for lucky finders to stumble upon. 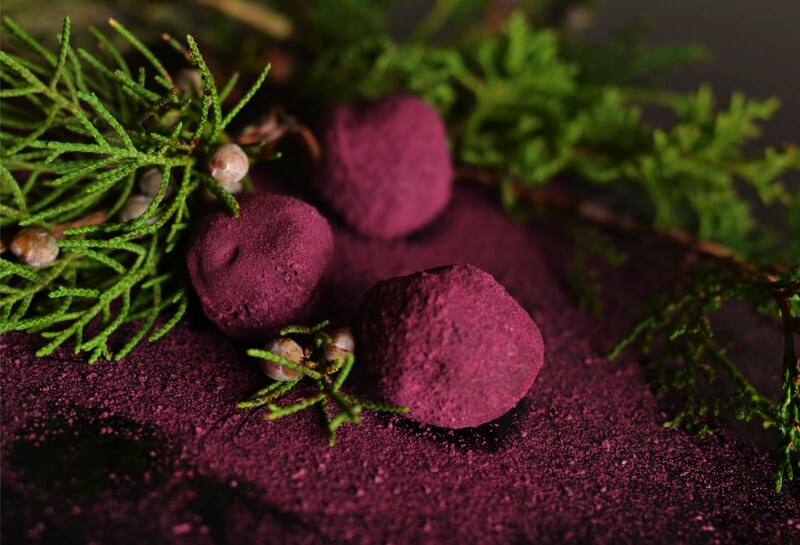 We had a delicious dinner of all-purple foods, flavored with the plants from the surrounding forests. The guest list was really interesting- a couple of families with small children and a handful of 20-somethings. I was in the kitchen for most of the dinner but I chatted with the guests afterwards, who pointed something really interesting out to me: to the adults, this experience was absolute MAGIC. I mean, how many people can say they went to a dinner party hosted by a fairy after they found an invite on a fern in the woods?? It was clear that the adults were charmed. But for the little girls, this dinner was a lot of fun, but it was also hilariously normalized to them. Like, of COURSE they were at a dinner party hosted by a fairy, DUH. It was business-as-usual for these little girls, because in their world, magic is an everyday discovery. I was utterly charmed by their matter-of-factness when talking about the event to their parents later. So how can we, as adults, allow ourselves to go back to that wonderful place of experiencing magic that was so familiar as children? I've been noticing more and more projects aimed at adults lately. One of my favorites, The Mysterious Package Company, is an organization shrouded in mystery, offering secret mysteries and puzzles for purchase. Just the way their website is organized and their email letters are structured makes something inside me shiver with excitement. There's magic to be found in the world of health and healing, too. Did you know that a recent study came out showing that placebo pills actually help heal people, even when they know it is just a sugar pill? The power of our own brains is immense. Perhaps more healing is done just by believing that whatever you are doing works than by the actual medicine itself? I'm not saying to stop going to your doctors and that you can heal yourself with just your mind, but I do believe that doing something with faith and intention gives it a much higher chance of actually working. I think about that anytime I prepare an herbal remedy to sooth a minor health concern, that just by believing that it will help me I am one step closer to feeling better. I have faith in science, I have faith in my own brain, and I have faith that magic exists even if you're not sure where to find it. I also want to be part of the reason people still believe in magic. That's why I do surprise events for lucky finders to stumble upon. That's why I create real-life narratives of fairytales and ethereal characters. That's why I encourage wonder and play... because it just makes life so much more shimmery. Did you know that roughly 50% of Icelandic residents still believe in the existence of elves? Even grown adults put out a little bowl of porridge on Christmas Eve to offer goodwill to their smaller hidden neighbors. We co-exist in this world with so many magical and bizarre creatures, why is the belief in elves any stranger than believing in, say, a bird that attracts a mate by curating an immense and bizarre collection of random colorful forest tidbits? Or trees that communicate with each other through a vast network of mycelium in much the same way that we use the Internet? The line between 'magic' and 'science' is so blurry that I would argue it's nonexistent. Sometimes the things we see as magic are just the things we don't have a scientific exploration for yet, but having that explanation doesn't make them any less magic. What do you think residents in a small town in the 1700s would have done if they saw you using a modern-day cellphone? Probably would have had you burnt at the stake as a witch. During the times of the Black Plague, witch doctors burned aromatic herbs to "banish the demons," but as we know now, smoke is highly antibacterial and likely DID play a major role in banishing the germs that caused illness. How many allegorical caves have we emerged from in our short human history on this magnificent planet? So, so many. And we will continue to emerge from many more, even in our own lifetimes. The cosmic nature of discovery is endless and, if you ask me, absolutely magical. I've taken it upon myself to devote my work to conversations about magic, wonder, and connection. This is so meaningful to me I feel absolutely COMPELLED to do it. That's why with every piece of artwork I make, I envision the happy use of it in the future as I make it, just in case someday we learn that the intention behind creation is as important as the physical object itself. I'll keep designing objects meant to spark a reaction of wonder or curiosity. I'll keep gifting surprise experiences to strangers so that they, too, can experience something magical. And through it all, I'll keep learning and learning and learning. I'm curious- what does magic mean to you? Yesterday was the Autumn Equinox, the point of time between the longest day of the year and the shortest. The period of time between now and the Solstice can be difficult for many as the expanse of the dark void of winter spreads out in front of them. But I'm actually pretty excited. Have you ever noticed how every season has a different feeling? In spring, I can't focus because I'm just too alive and busy and curious and overwhelmed. It's the season to be running around outside taking in all of the new life because things change so FAST! But fall is quite different. August always feels stagnant, wistful, and nostalgic. I get restless and moody. Time seems to move very slowly in late summer and I become stuck on memories and the past and the future and the question of where I am in life and if I'm happy. But once the cold air of September starts trickling in, that mood changes. Because fall is Trickster Time. It seems entirely fitting to me that my culture celebrates Halloween in the middle of this changing season. The way to survive the dark is to embrace it, to question the shadows at the edge of our field of understanding, and to pursue them. Fall is also mushroom season. Have I mentioned that I go a little crazy during mushroom season? Mushrooms are, hands down, the most enticing wild food I forage for. They are not a plant (their DNA is actually more closely related to that of animals than plants), and they seem to carry with them an energy that is just, well, mischievous. Mushrooms can play many roles: some are healing, some are delicious, some are mind-altering, and some are even deadly. Some mushrooms can be all of those things, depending on environment and preparation! You have to be really focused to hunt mushrooms; one wrong identification could have deadly consequences. It took me a long time to even begin because I was so intimidated by that, but now I fully understand the allure. Guys, mushroom hunting is FUN. 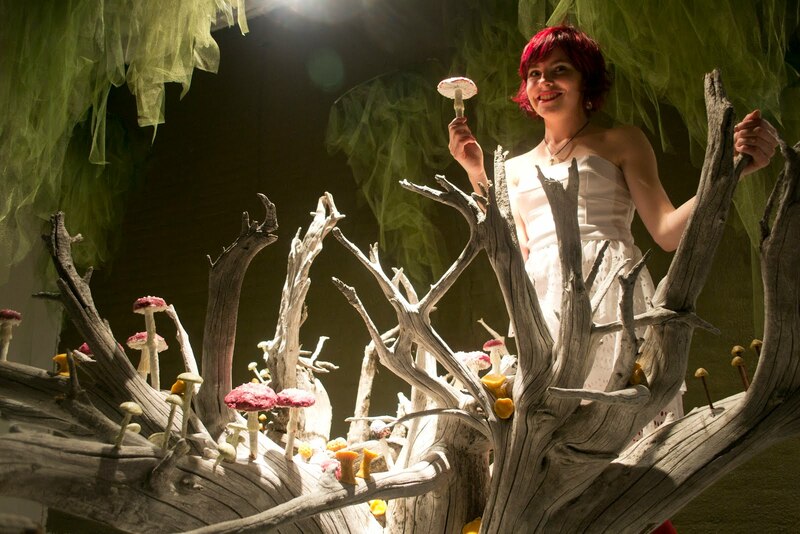 Mushrooms flirt and hide and draw you deeper into the woods. They bring out the superstition in all of us. "Maybe if I just walk quieter, they won't hear me coming," you think to yourself before catching how ridiculous that sounds. "Maybe I should carry a smaller basket so they don't hide." Good mushrooms spots are carefully-guarded secrets. Any mushroom hunter worth his salt knows it goes against the code to ask another mycophile about their hunting grounds. Don't ask, don't tell, it's every person for themselves out there. And did you know there is a whole theory about mushrooms being the true root of our modern-day Christmas? Whether or not you believe this theory, it makes for a pretty compelling story! When I first heard about this I became absolutely fascinated. I often feel that bright and happy yuletide parties about cheer have felt a little off considering the darkness of the season. That maybe we try a little too hard to pretend the darkness doesn't exist, and that just makes an already-tough time of year even worse. There is something deeply satisfying to me to embrace the dark mysteries of midwinter in the setting of a warm and cheery yuletide party. It was thoughts like that that inspired Grovfor, an interactive installation I designed a couple of years ago. I was initially inspired by the bouche de noel (a tradition of making a yule log cake to eat on the longest night of the year), which are often decorated with confectionary mushrooms. While planning to make one I realized that I was actually far more interested in the confectionary mushrooms than the cake itself, so I decided to focus my energy in that direction and explore the idea more thoroughly. What resulted was a Willy Wonka-esque installation where guests were invited to pluck their own mushrooms from gnarled stumps in a dark forest environment. Dark, mysterious, and a little mischievous. Just the way I like it. As the crisp September days fade into October and the darkness of midwinter looms, I move beyond the exciting treasure hunt into a deeper level of mystery. This time of year I am drawn to stories of buried treasure and unsolved mysteries....of secrets hidden beyond my reach and questions that just can't be answered. Lately, I've become obsessed with Shipwrecks. Living closer to the coast this year has been a wonderful experience and many times I have gone out very early in the morning and stared at the vast expanse of water as the sun came up behind me. I find it incredibly humbling to consider all of the strange things buried under the ocean's weight. "The ocean remembers all. She gives and she takes." was a thought that echoed around in my head when I'd stare out at the choppy seas of December and realize just how small and fragile one human life is when faced with the almost-infinite vastness of water ahead of me. What lurks in the deeps? What secrets are lost to the depths? I read an article a while ago about a 108-year-old message in a bottle washing up on shore. While this story lacks the romance of love letters washed ashore, the thought that something could be riding ocean waves for over a century and then just randomly wash up somewhere is astounding to me. Speaking of bottles, another article mentioned 200-year-old beer being recovered from a ship intact. They even sampled it! Can you imagine tasting beer that had sat on the bottom of the ocean for centuries? What a fascinating curiosity us humans have. Apparently it's not the first time that's been done, either. 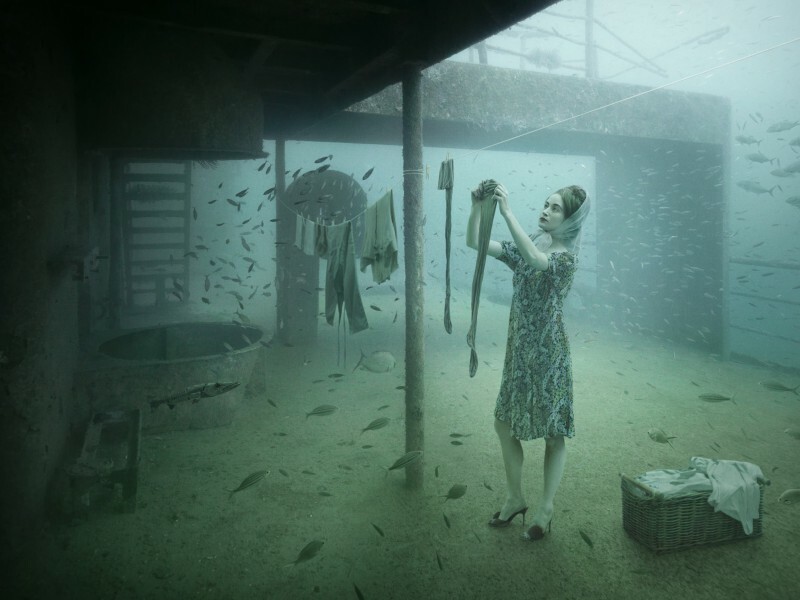 Andreas Franke photographs shipwrecks and then photoshops characters into them to create surreal visions of life at the bottom of the ocean. These images are then exhibited on the shipwrecks themselves and grow upon them a layer of sea-bottom detritus further adding to their story. I find them haunting and beautiful, definitely a juicy feast for the imagination. It makes me think of the rumored underwater city of Atlantis, proof that the mysteries below the waves have excited human imaginations for centuries. Oh, winter oceans, how I love you. Sounds pretty intriguing, eh? 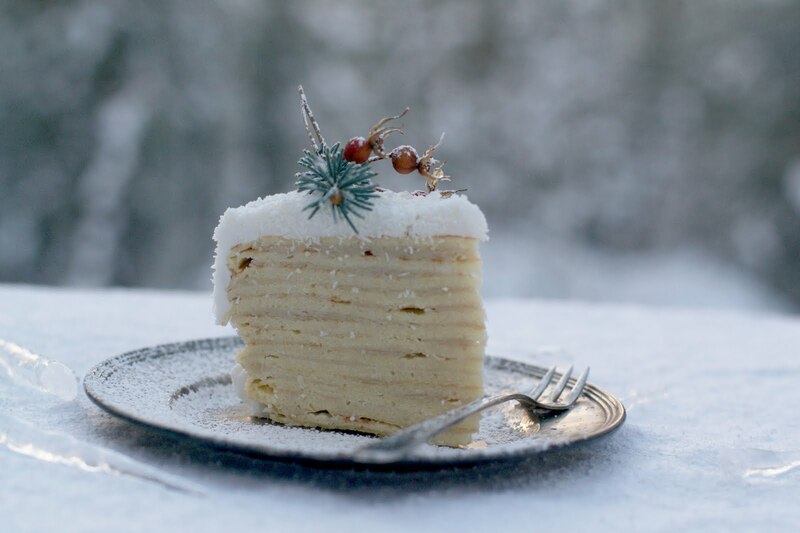 I first read about julklapp in an obscure little book on Norwegian recipes. It was a tiny paragraph, almost a footnote, but it has stuck with me for YEARS. Just googling it won't get you much- apparently the very loose translation is "gift." Seems a little more fitting when you factor in that the German word "gift" means "poison..."
Okay, now I'll tell you about it. So you begin with a small gift, and you wrap it. And then you wrap it some more. And then you tuck in some riddles or jokes, and then wrap it more. Perhaps you roll it in a ball of yarn to make it seem as though the yarn is the gift. Maybe you even wrap it in dough and bake it like a cake but then when the recipient bites into it- surprise! But I'm getting ahead of myself. So you have this gift that you've wrapped like a gazillion times in many different misleading layers, but you're still not done. The last layer should be something rather squishy like tissue paper or yarn or hay. Then comes the fun part: dodgeball. The goal of julklapp is rather like Secret Santa- you want your identity as gift giver to remain a secret. The way the presents are delivered is that sometime during the day of celebration they are unexpectedly thrown at the recipient as the giver quickly runs away so as not to be seen. Yep, that means that anytime during the yule celebration you could be suddenly pelted with your surprise gift, which is actually more of a puzzle. CAN THIS PLEASE BECOME A THING? It is always a let-down on Christmas morning when gifts are unwrapped with such abandon that the whole scene becomes a blur of torn paper and ribbons and then you're left sitting there in a haze wondering what just happened. It all goes by so FAST! I love the idea of prolonging the process of exchanging gifts. Throw in some mischief to match the season, and I'm totally sold. So, there are a few of the things I'm thinking about tonight as I prepare myself mentally for the dark days ahead. I wrote this mostly for my own reference but if you're reading along that's cool too. What kind of energy do YOU think fall and winter carry? Are you excited to embrace the darkness? 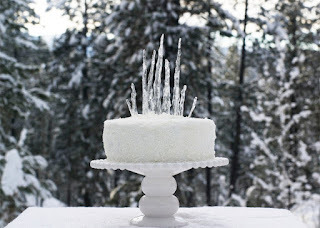 Glass artist, culinary and experience designer, mountain girl. Inspired by plenty of time in the woods and the dance between senses.